How to Play The Descant, Treble, Tenor and Bass Recorders, full online instruction. 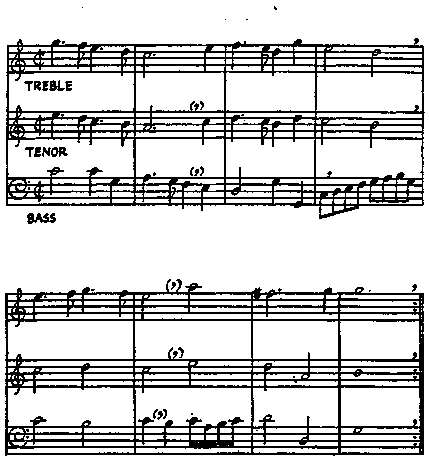 Trios abound in various combinations of instruments; the favourites are descant, descant and treble; descant, treble and tenor; treble, tenor and bass. There is enough published trio music to last the player a lifetime. Example 42 is one movement taken from a popular suite by J. C. Faber composed in the first half of the eighteenth century. There is a good modern edition of this for treble, tenor and bass edited by Edgar Hunt. The whole suite is rewarding to play and is not difficult.